Three times appeared to be the charm for triple Fox Air DH winner Stevie Smith, though the trio of ankle injuries which brought him to Wednesday evening’s win left him more rattled than he could have imagined. Over the course of the last year, the man who stood on the sidelines in 2014 and watched Mick Hannah crush the event he previously owned has been through more ups and downs than he experienced shuttling logging roads in Lady Smith, B.C. 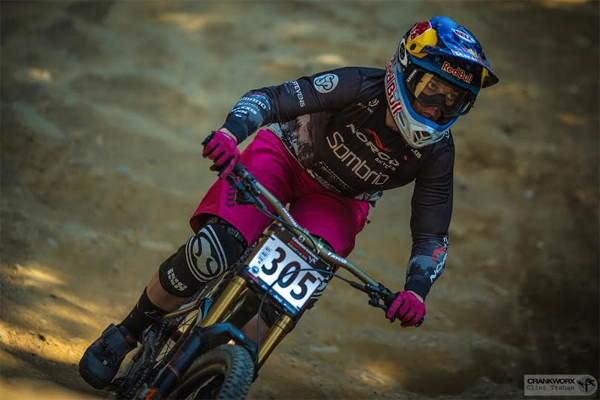 He and his mom have famously tackled the rugged terrain daily for years to bring him to the pinnacle of the downhill mountain biking scene, but 2015 put serious strain on the dream. “I’ve gone through three injuries on one ankle, so each one of those I was trying to get back to where I needed to be—and then another setback, and then another setback. It’s been hard on the brain,” said Smith as he gave his interviews in the finish corral after besting Sam Blenkinsop for the win. Smith spent the year cultivating that vision of being on top, but quickly discovered the comeback climb would not mean jumping back in for first place finishes in the World Cup circuit. Finally rounding the curve on normal, he glowed under the blistering afternoon sun as he took in the victory. “I’m 25 years old, and really healthy, and I even got shingles last year due to stress. So it proves how hard (injury) is on the brain. A broken ankle is no big deal. You can deal with that, but one after another after another. To be out here racing and just riding my bike is a dream come true,” he said. Known as the heart of Crankworx Whistler, the Fox Air DH rolls down the Whistler Mountain Bike Park’s most iconic trails. Every turn is a berm. Every jump is a tabletop and every moment is a battle of mind over matter. Some 375 racers dropped the 1200 vertical feet of non-stop bank and boost Wednesday before a live webcast and hundreds of mountain biking fans. With more than one racer in little more than their pads and shoes, it also kicked of the raucous revelry so iconic to the Whistler leg of the Crankworx World Tour. Winning it for the women, American racer Jill Kintner said it is this course, and knowing every bump and turn, that really launches her week. Riding dry trails in the heat, Kintner said she tried one practice run on a light ride and quickly bailed out. “I did one run on my trail bike and felt sketchy as hell, so I was like I’m not riding this thing. Had I put time into changing my tires and getting the right disc-rotors on there, it could have been good, but it’s kind of a fine line between how far you want to push it versus rolling speed. So I went with my downhill bike,” said Kintner. With the Fox Air DH done, there is just one race left in the Crankworx DH Championships—the Canadian Open DH. 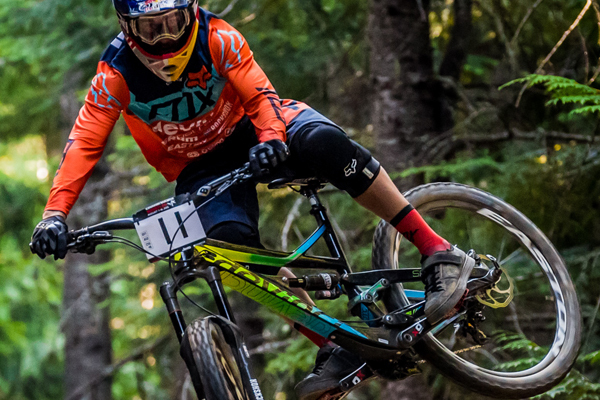 It will be the final event of Crankworx Whistler, scheduled for the day after Red Bull Joyride.